Photoshop is a universe of limitless potential. With a plethora of tools to choose from, those quick to master them can literally design worlds. Here are some tips and tricks we’ve honed that can take you a step closer to designing your own world! Doesn’t it frustrate you when you lose the quality of your images after multiple resizes? That's not the only thing though - precious time is also lost when you need to reimport them. Save yourself a few extra minutes by using the Smart Object function. It allows you to transform your images without compromising its quality, no matter how many times they're resized! It's especially handy to convert layers to Smart Objects if you’re unsure about the ideal dimensions required. To convert your layers to Smart Objects, right-click on an empty area on your layer, hover to the 'Convert to Smart Object' button and click on it. In those simple steps, the quality of your images will be retained throughout your editing process! Note that Smart Objects also prevent any filters from being applied directly onto its layer. If you apply a filter, a Smart Filter layer will appear below the Smart Object layer. By deleting the Smart Filter layer, this allows you to back paddle on your filter choices if the outcome wasn’t what you'd expected. No more CTRL+Z! Editing a particular layer can be a lot tougher with other eye-catching elements that steal its focus. Here’s a quick tip to make editing layers a lot simpler - particularly when you’ve reached the 60 layer mark! Single out a chosen layer by holding down the Alt/Option-button (for Mac; Ctrl button for PC) and clicking on its eye icon. This will immediately disable all the other layers in the file. Repeating the same actions after you’re done will reinstate all the layers of the file to its original viewing capabilities. Gone are the days of enabling and disabling layers one-by-one, which is a dreadful and time consuming task. Now you’re ready to conquer a hundred layers if needed - although we hope that's not an achievement you wish to reach! This tool is definitely one of the most underrated tools in the panel, often overshadowed by the popular Quick Select function. However, unlike its more frequently used counterpart, the Magnetic Lasso tool does not make the outlines of your cut-out blurry; rather, its seamless cuts are more refined and ready to be used without any additional touch ups needed. 1. On your keyboard, click L to use the Magnetic Lasso. 2. Drop the pin on the outskirts of the element you wish to cut out. 3. Click on it ONCE. 4. Go around its perimeter carefully until you’ve covered the entire outline, and returned to your initial point. 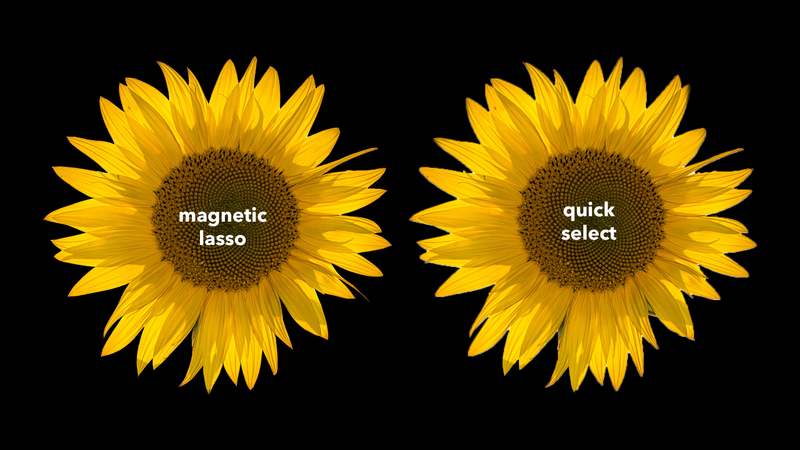 Here's an example I did with both tools - can you spot the difference between both sunflowers? The Quick Select tool may be an efficient enough way to get the job done, but it won't necessarily produce the best quality your design work deserves! Eagle eyes may notice that there are still bits of leftovers from the background on the Quick Select flower, while the one outlined with Magnetic Lasso is much more refined. Give the Magnetic Lasso a go the next time the occasion calls for it! It’s hard to work on a Photoshop canvas at times, especially when you need to twist and turn your wrist for a more comfortable angle when designing. The good news is that you no longer have to stress your wrist - Photoshop allows you to tilt your canvas to a comfortable angle, particularly when you’re using devices such as a Wacom or other digital sketchpads. This is akin to an artist placing his physical canvas or paper at a comfortable angle when drawing or painting. To do this, click on the R key once and spin your canvas to an angle that is most comfortable for you. When you’re done with retouching, click ESC to reset the canvas to its original angle. Now that touching up has become a lot easier with this tool, there's no need to angle yourself into awkward and uncomfortable positions! Colours are an important consideration in any design work, as it conveys tone, mood, and feeling. A well-balanced colour theme makes your image visually unified and appealing - but what happens when some colours don’t seem to go well together? 4. Under colour overlay mixer, select your desired colour. 5. In the Blend Mode of the colour overlay, select Hue or Colour. The great thing about this trick is that the Blend Mode adapts your colours to the conditions of the background, which helps to retain the shadows, gradients and natural lighting of the raw image. Now, there won't be any more hue and cry over conflicting colours - just change them as you wish! We hope these revelations make you realise how much more efficient you can be as a designer. So, go forth - jump back into Photoshop, try out these tips, and start designing your world! All original graphics created by Amirul Firdaus. Amirul contributes to the AKÏN design team through crafting branding and social media guidelines, conceptualising and executing logo designs, and creating online and offline marketing materials. He believes that good design should go beyond just mere visual appeal; rather, it should delve deep beyond the surface to stir up a good feeling or a fond memory in the viewer. This philosophy sets the very foundation in the art and designs he produces. 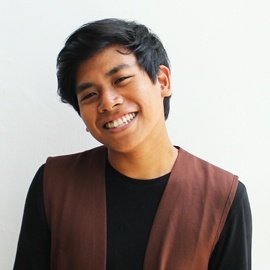 Amirul graduated from Republic Polytechnic with a Diploma in Design for Interactivity. Aside from being proficient in Adobe Photoshop and Adobe Illustrator, he also works with media software such as Adobe Premiere Pro. In his free time, Amirul can be found kicking back at a cafe with a sketchbook full of fashion illustrations, or babysitting his nephew at home.